Accelerate the path to conversion by delivering the best products and deals on the web to your audience with eBay’s new Buy APIs. 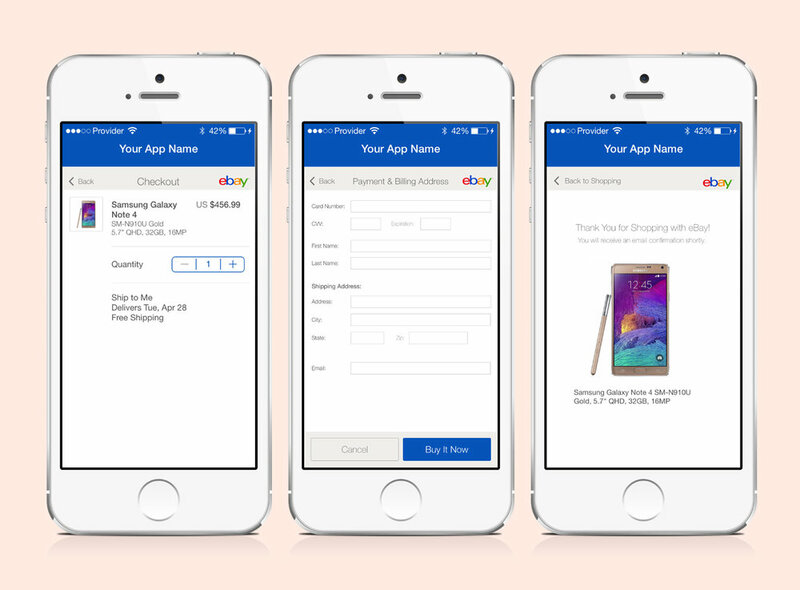 With our 4 Buy APIs, you can create a complete conversion-centric experience in-app or on-site that enables your shoppers to check out and track orders without ever visiting eBay.com. Give them exactly what they're looking for with the Browse API. Convert buyers based on their specific keyword and category searches. Enable visitors to search eBay on your site by keyword, category, eBay Product ID (EPID) or Global Trade Item Number (GTIN). Be Platform Agnostic with the Feed API. Our inventory is your inventory. Create rich shopping experiences with the best of eBay’s 1 billion listings worldwide by retrieving daily details of newly listed items across various categories, and custom-curate the listings to your shoppers with any of the fields returned in the feed file. Inspire Shoppers to Spend More with the Marketing API. Increase your commission per checkout by injecting product discovery into your site’s experience. Cross-promote products that were also purchased and viewed by shoppers who bought those items; feature Best Selling products on eBay; and upsell by showing product collections based on demand, reviews and buyer journey location. Close the sale right where it started with the Order API. Help your buyers over the finish line faster with a truly uninterrupted, seamless shopping experience. The Order API supports eBay member checkouts with PayPal, and guest checkouts with credit card transactions. Your buyers can view order details such as shipment status once the order has been placed. Customer service requests, such as cancellations and refunds, will continue to be handled by eBay. We are excited to learn how you will build amazing new buying experiences leveraging our Buy APIs! These APIs are available to explore in sandbox today for anyone who has an eBay Developer account (if you aren’t an eBay Developer yet, join now). First, fill out an application here and provide all the necessary documentation. We will review it within 10 business days. In your scheduled kick-off call with the eBay Developer team, we'll walk through your diagram and provide recommendations/consult if you have any open questions. Please be prepared to walk through a data flow diagram and your mocks of the user experience. Upon approval by EPN, we will send you the eBay Buy API contract to sign for access to the Buy APIs. Please fully read the minimum requirements here. Upon approval by PayPal, PayPal will send you a contract to sign for access to their risk libraries. PCI compliance is required and there may be additional PayPal risk provisions and safeguards for your application and the API flow. You may also be required to sign Mutual Non-disclosure Agreements (MNDAs) depending upon your business model. After you test and build mocks/user flow diagrams in sandbox, your next step will be to contact the Developers Network to request approval to access the Buy APIs in production. We will require an app check with our developer team to ensure that you are successful in setting up the Buy APIs. Once the app key is pushed to production, please schedule an expected timeline for launch. We have 20 XML, SOAP and RESTful APIs as well as Software Development Kits for Windows, Python and Java. In this downloadable white paper, we’ve narrowed this list down and dive deeper into to 4 core APIs proven to be the most successful with members of eBay Partner Network. If you have any questions or would like to learn more, please email us or reach out to your Partner Manager directly.